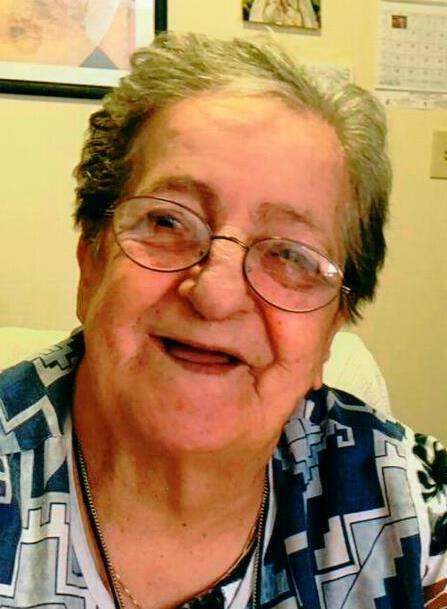 Irene (Arruda) Rios 88 of New Bedford, passed away Thursday September 13, 2018, surrounded by her family, at St. Luke’s Hospital. She was the daughter of the late Joao and Maria Gloria (Farias) Arruda. She was born in New Bedford and lived here all of her life. She was a communicant of St. Anthony of Padua Church. She was formerly employed as a floor worker at Grinnell Pajamas until her retirement. Survivors include her son Primitivo Rios Jr. and his wife Melissa of New Bedford; her daughters Mary Rios of New Bedford and Alice DaPonte and her husband George of New Bedford. Her grandchildren Cheryl Johnson and her husband Derrick, Gina Fernandes, Timothy Rios, Eric Ramos, Crystal Rios and Curtis Rios. Her great grandchildren Ashton Rios, Nevin Paulino, Derrick M. Johnson and Darrius Johnson. She is also survived by her brother Jose F. Arruda of Portugal and many nieces and nephews. She was the sister of the late Alfred Arruda and Alice Fumo. Her funeral mass will be said 10am Monday at St. Anthony of Padua Church. Visiting hours are Sunday 3-6 pm. Burial will be in Pine Grove Cemetery.
" The Matriarch of Our Family"
You have endured many hardships and heartbreak in your life…still you had so much love to give to your family. We admire your strength and your spirit… you raised a family alone, in a time when it was very difficult to do so. You have always been available to your family… and willing to help in any way you could…you had such a big part in raising your grandchildren. We have many memories and funny stories of the time we spent at Grandma’s! We love you and we are so happy to celebrate your life…you are a part of our heart forever!